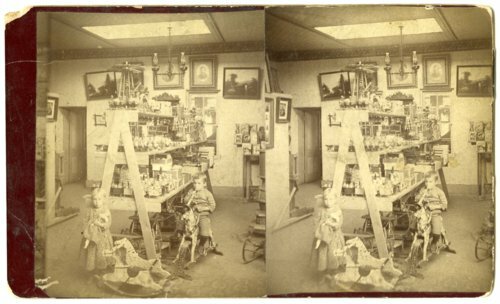 This stereocard shows a rare view of the interior of the first store in Alma, Kansas. The Schmitz and Meyer Store opened in 1867. In 1874, Henry Schmitz sold his interest in the enterprise to his partner, August Meyer and Meyer's wife, Emile. In this view, children's toys are seen on the shelves.